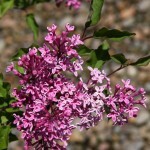 A compact shrub with small leaves and very fragrant lilac colored flowers. Blooms in the spring and then again in mid-summer, continuing until frost. Prune the spent flowers off to encourage a better re-blooming. It prefers full sun and a well-drained soil. PP 20,575.